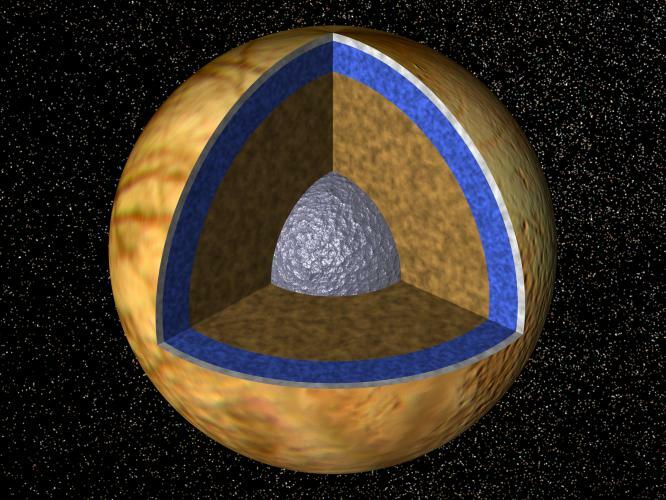 We finished our major science missions – profiling and glacier exploration. Our next goal is to obtain reasonably good bathymetry of the lake bottom. We obtained partial coverage last year, and we will attempt to fill in the gaps this year. We ran fully autonomous missions with zero manual intervention during the missions. These missions are easy for all of us and it was nice to relax and just watch the data flow. More on this later. 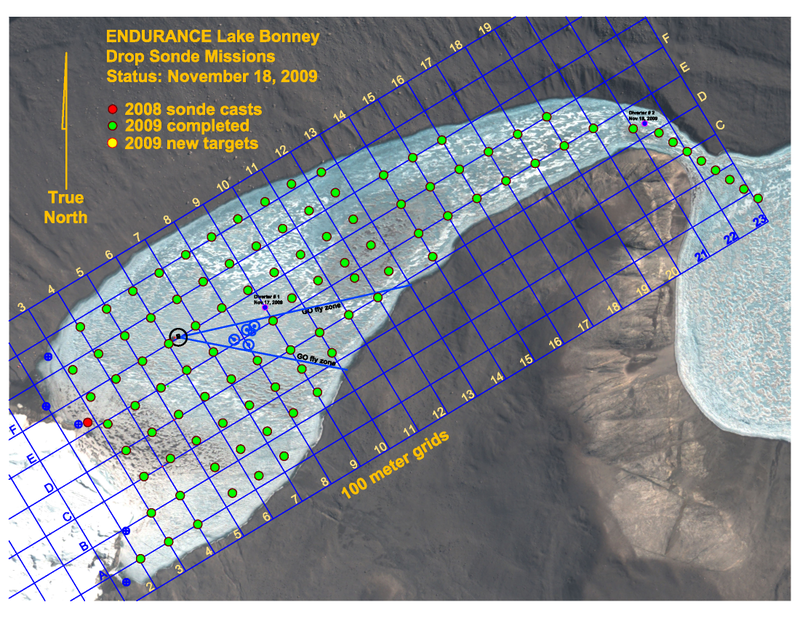 Bathymetry coverage of West Lake Bonney obtained during 2008 missions. Nov 25 – Exceeding expectations! We had an awesome day today. The first mission of the day was to try and get pictures of the grounding line of Taylor glacier. We had attempted this yesterday, but were not able to get the bot close enough to lip of the glacier to take pictures. We still could not get close enough to get pictures of the grounding line, but we were able to take pictures of the lip and confirm that it was ice, and of the lake bottom and confirm that it was sediment. In addition, we saw some interesting low temperatures (less that -4 degree Celsius) during our sweep, indicating fresh water inflow from the glacier. 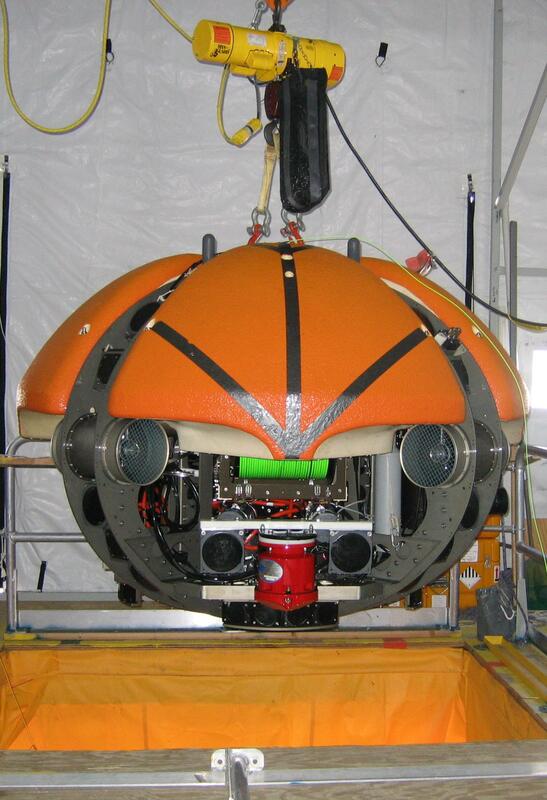 The second mission was an automated bathymetry mission where the robot performed a side sweep of the shore. This mission was entirely automated and worked perfectly. It was very nice to sit back and watch the data flow and the visualizations. I will let the pictures do the rest of the talking. If you are interested in the details of the visual homing algorithm below, please visit my publications page. We start every day with a short meeting. Everyone was looking forward to new discoveries. The bot drove to the glacier melt-hole and surfaced up using visual homing. 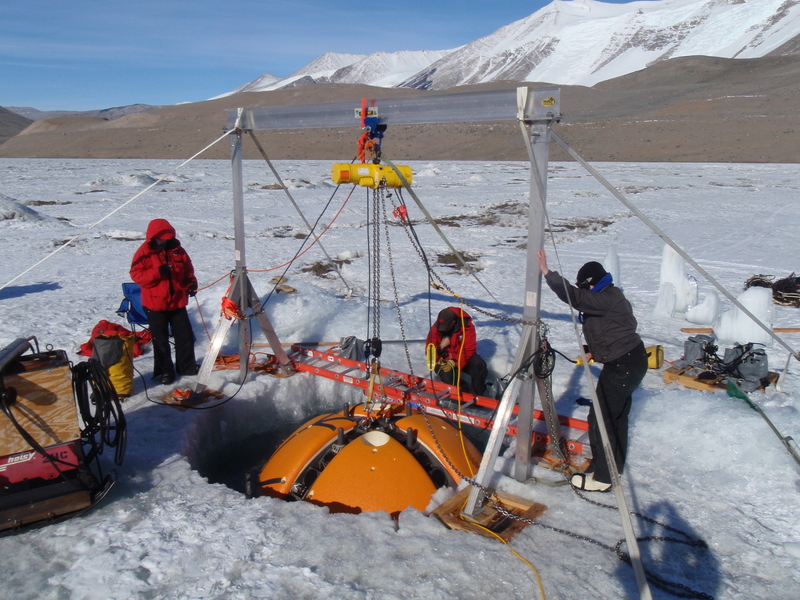 We added weights to the bot here to enable it to descend and be neutrally buoyant at a depth of about 22 m.
Images taken by the upward looking camera on the bot during visual homing to rise up the glacier melt-hole. 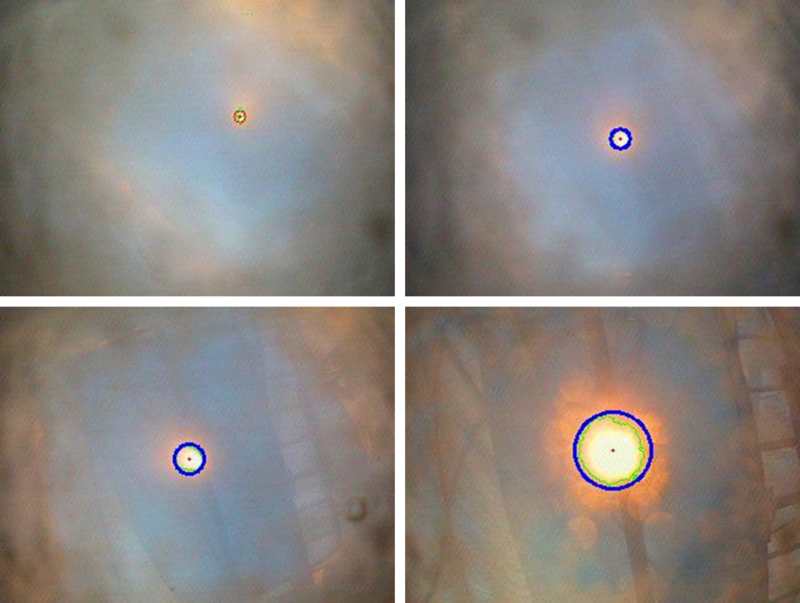 During visual homing, the bot moves in a spiral pattern to search for a light source, finds potential targets, identifies a blinking light as the target, centers on it and then rises up the melt-hole. 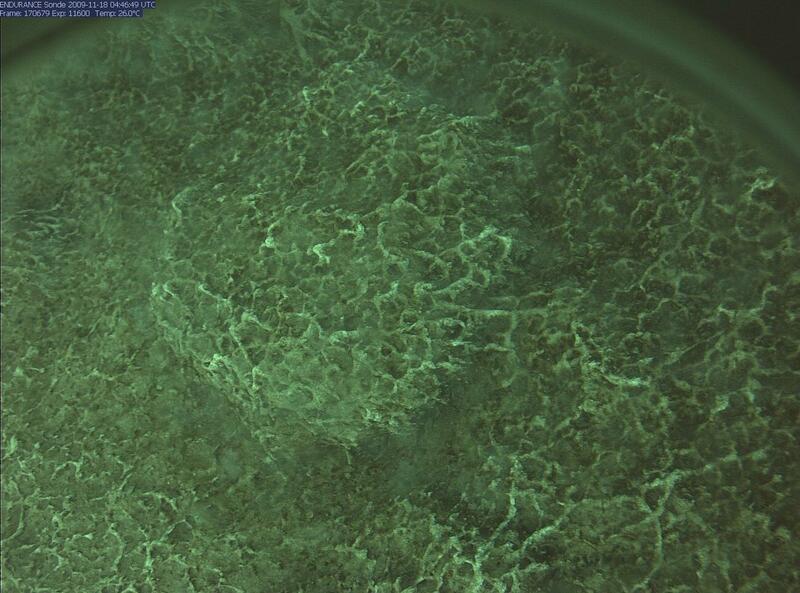 The water was turbid and the collimated light was barely visible unless the bot was right underneath it. The first image shows how the algorithm identified the light but failed to lock on to it since the bot was not directly underneath the light. On the arm of the spiral, the bot was underneath the light and locked on to it. The light appears bigger as the bot ascends the melt-hole. After ballasting, the bot drove underneath the halocline to the glacier lip. 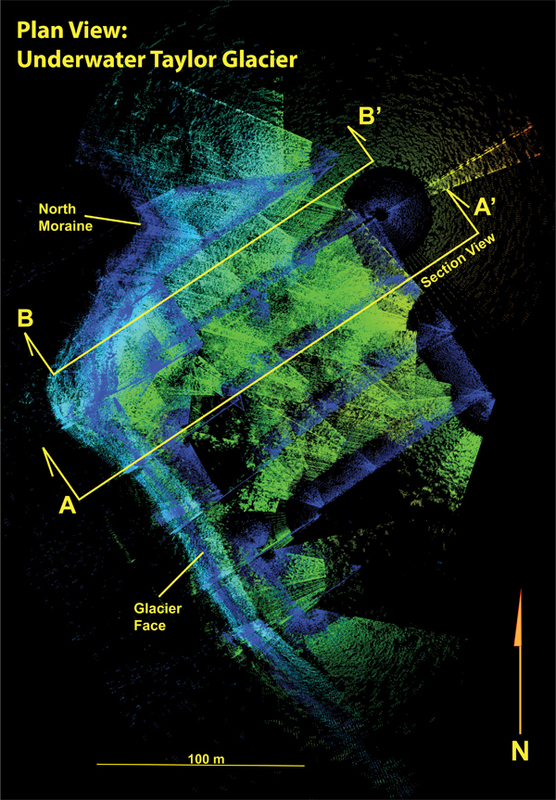 A visualization showing the bot approaching the lip. 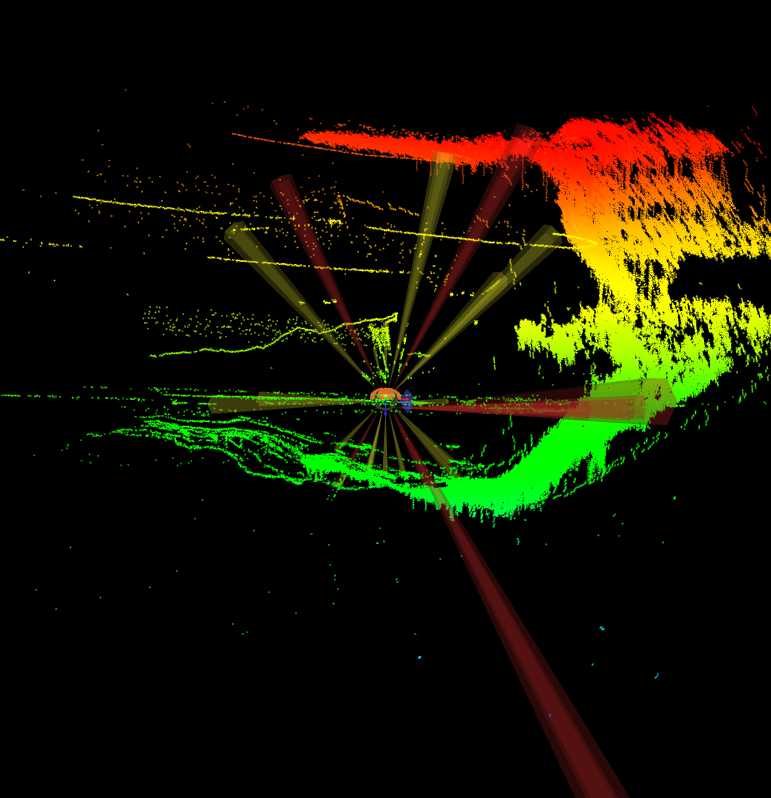 The beams radiating from the bot are sonars whose returns help us construct this visualization. The bot underneath the lip of the glacier. This mission kept us on edge all the time because we had to be very careful to not let the bot get wedged in the narrow cavity, yet get enough close enough to capture images. 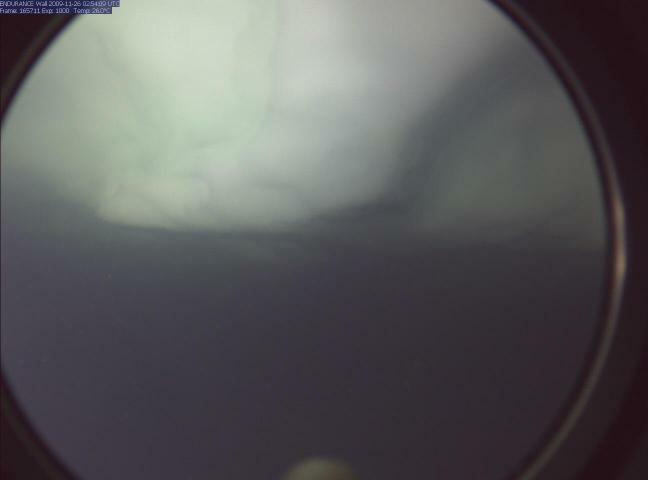 Image of the glacier lip captured by the forward-looking camera. 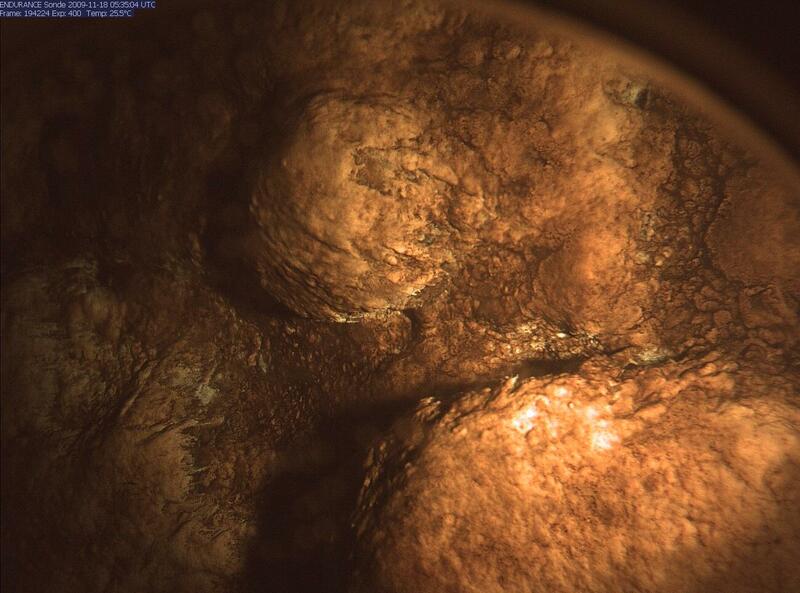 Image of the lake bottom beneath the lip showed sediment. This confirmed that the glacier does not go down all the way to the bottom but floats. In the current implementation, we spool the profiler down manually using reading from an altimeter. The altimeter tells us the height of the profiler from the bottom of the lake. Altimeter readings are not received continuously – sometimes we do not get readings for many seconds. This is possibly because of the changing reflectivity of the bottom, though the real cause is still a mystery to us. Hence, spooling down the profiler is partly an art. We need to remember what the starting height was and how much we have spooled. 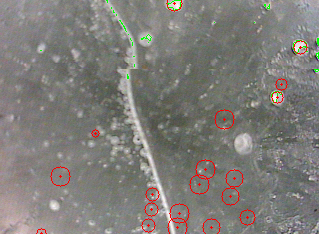 We also used the camera images of the bottom to estimate how far we are from the bottom. Our estimates were a little off at one grid point yesterday, and we spooled the profiler down too much. This caused it to run into the ground. The pump on the profiler ended up pumping a lot of mud through the rest of the mission, making the scientific data useless. Hence, we repeated much of the mission from yesterday. We cleaned up the dirt from the impeller blades of the profiler pump in the morning. Bill and John cleaning the dirt from the profiler pump's impeller blades. We again worked a 14 hour day, but this time we were successful in getting good data. Peter watched the data all day and pointed out some interesting facts. The temperature showed a dip at a depth of 20 m, indicating an inflow of fresh water from the glacier at that depth. Further, the inflow has now reached as far as the bot-house. 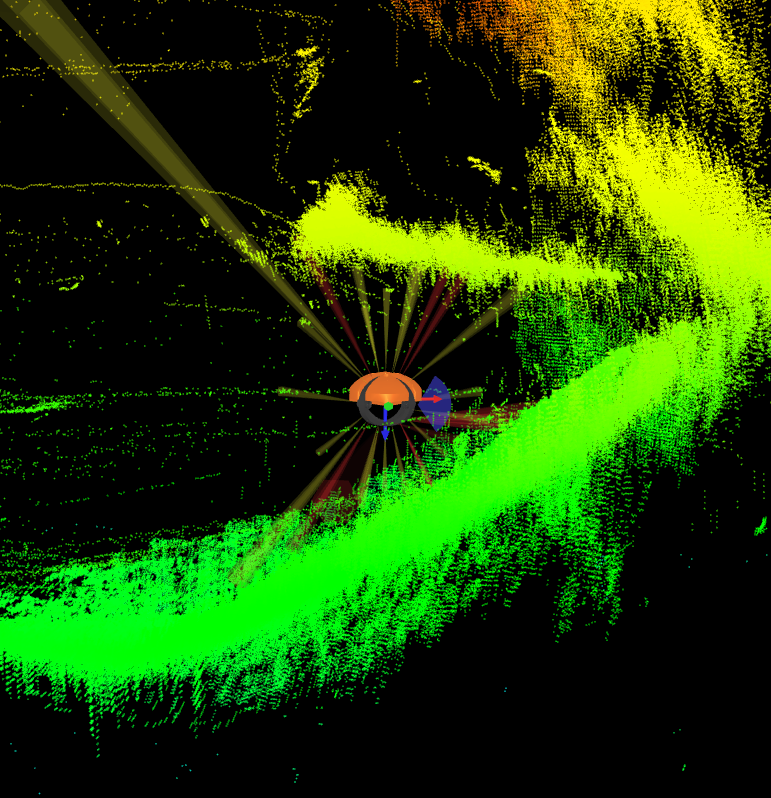 Bill made some visualizations of the glacier from the sonar data. No one has ever seen the underwater of the glacier in this detail, and it was very exciting for us to see this. I will let the visualizations speak from themselves. 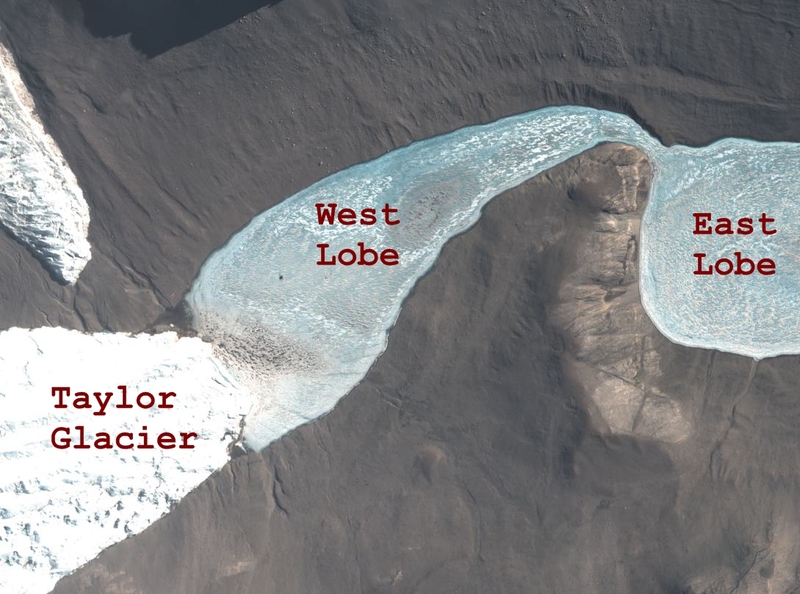 Top view of the underwater part of Taylor glacier (North up, East right). The light blue cloud at the right is the glacier. The green cloud is the lake bottom. 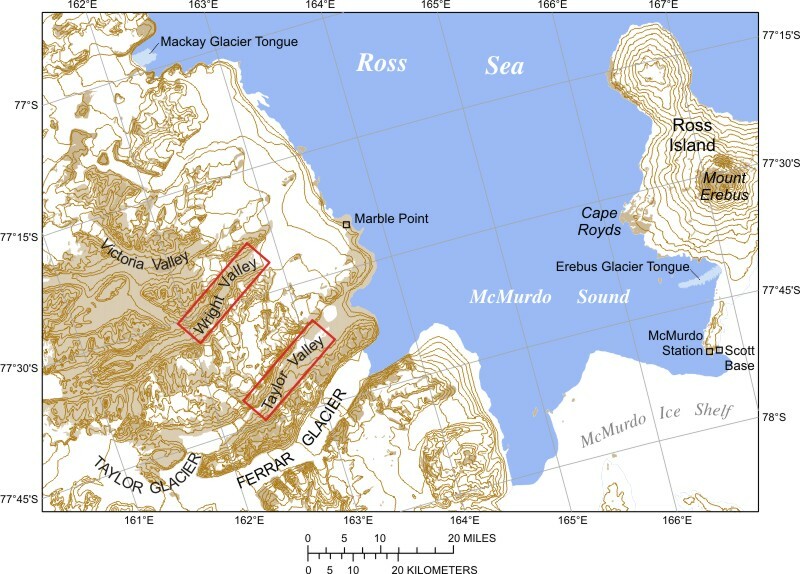 There is morain on the north side of the glacier. This cross section of the glacier shows the moraine. The middle part of the glacier has a "lip" or a protruding part at a depth of about 16 m. I posted some images in my previous post. We do not what is beneath the lip. It could be a cave. The grounding line may be beneath the lip. We will explore this in a couple of days by ballasting the bot heavy enough to get below the halocline. 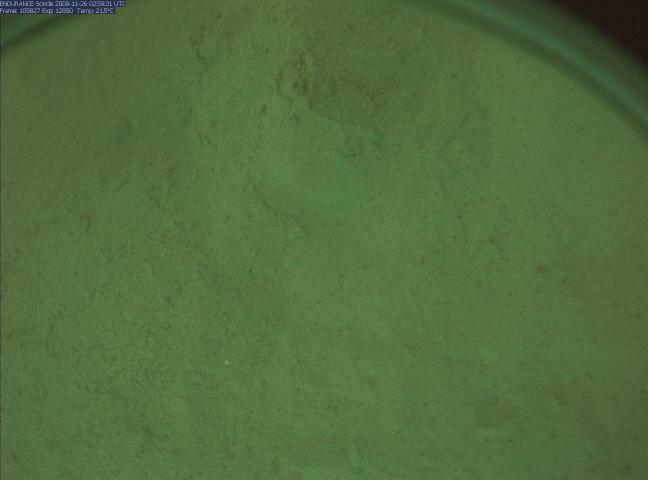 Image taken by upward looking camera on the bot. The lake ice in some parts near the glacier was thin and sunlight penetrated through it. Our melt-hole detector algorithm, that identifies potential light sources for visual homing, had a field day finding so many light sources. John, Peter and Bill mounted the winch for lifting the bot on the gantry at the new met-hole. 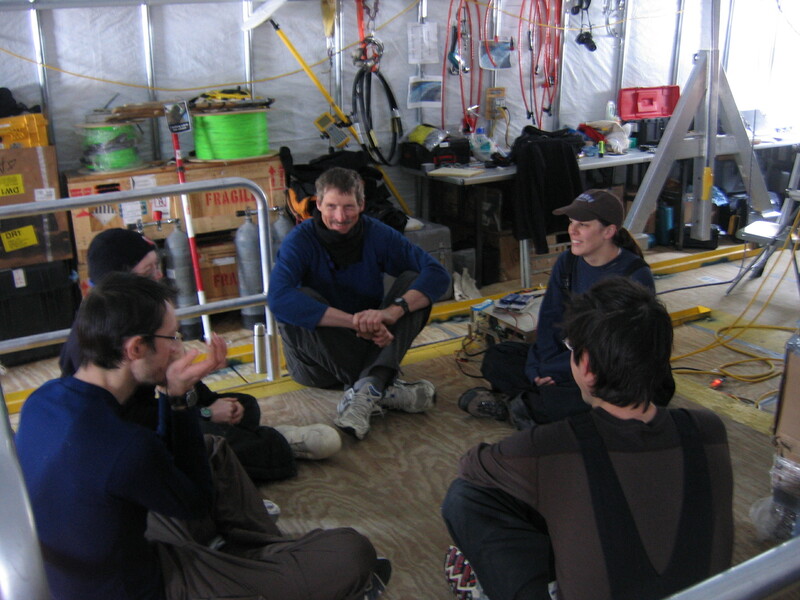 John left for McMurdo in the evening. 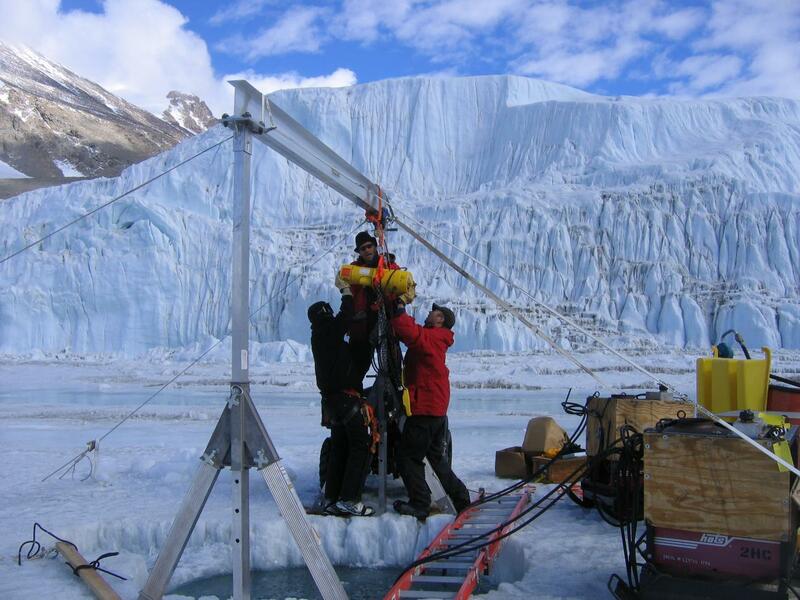 Bill, John and Peter mounting the winch for the gantry at the glacier melt-hole. 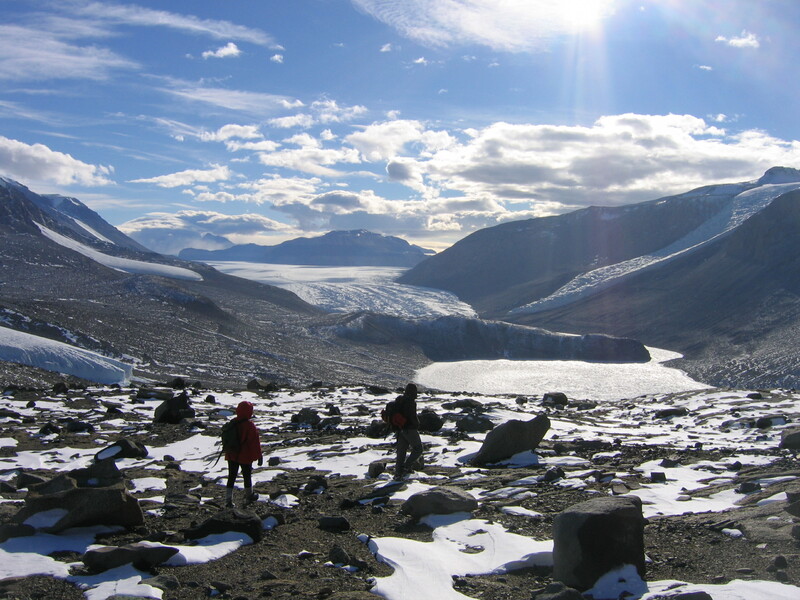 Nov 21 – Here we come Taylor Glacier! 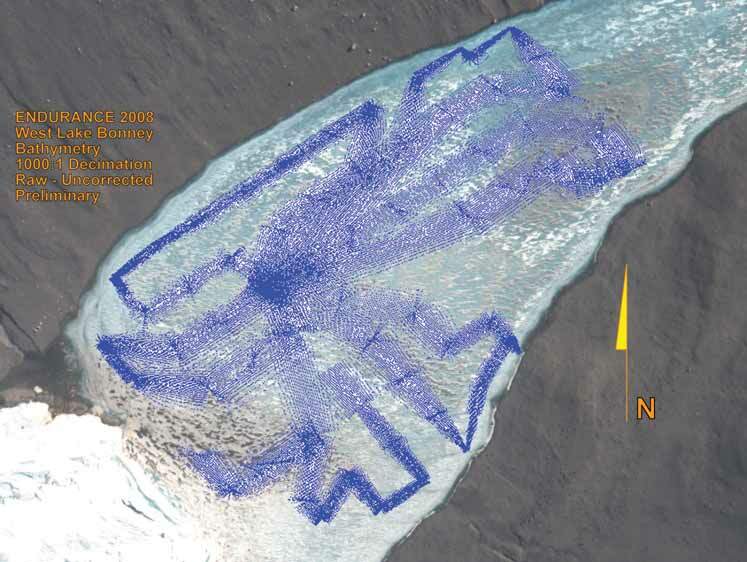 We performed a profiling mission on a high resolution grid near Taylor glacier. The hope is that a detailed analysis of water properties will help reveal the source of fresh water inflow into the lake. We worked a 17 hour day. It was an exhausting but exhilarating day and moved us one step to closer to finding the source. Below are some pictures from this year. For a complete visualization of the glacier face, see my entry from last year. 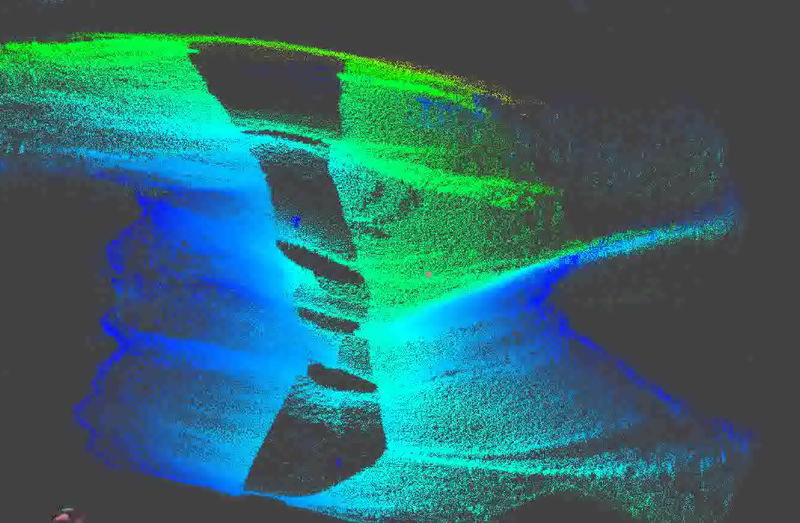 A view of Taylor glacier seen in the visualizer. 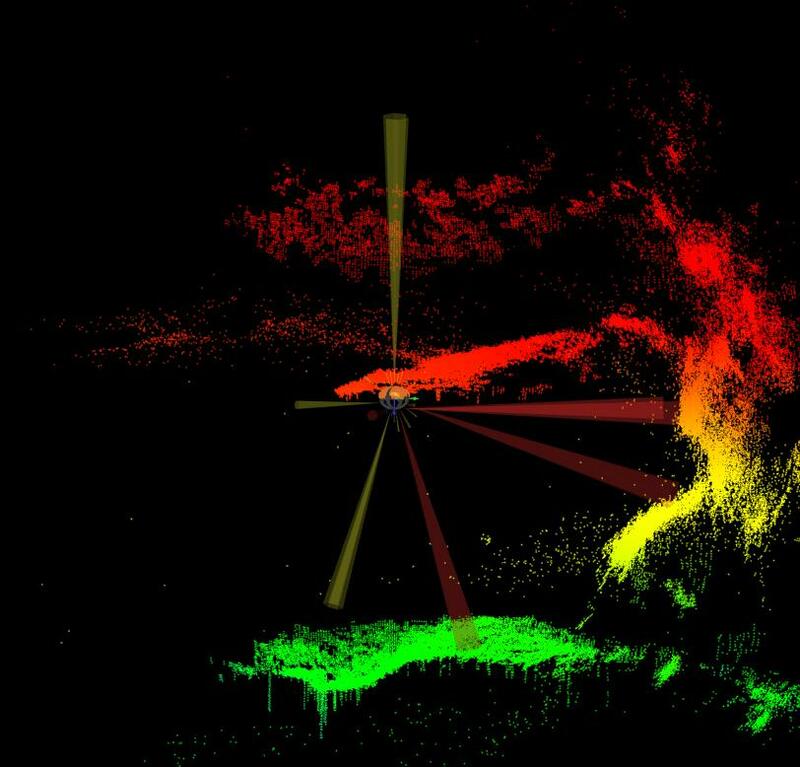 This visualization is continuously updated as the robot moves, using the data from the robot's sonars. The red cloud at the top is the lake ice. The green cloud is the lake bottom. The vertical wall is the glacier face. It looks as if the glacier is floating on water with a 'lip' extending outwards. For visualization of the entire glacier face, see my entry from last year. 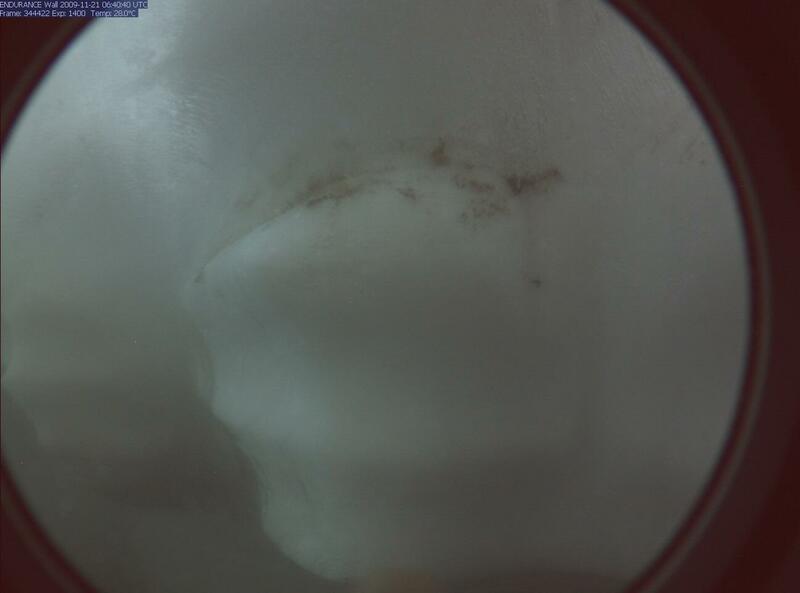 An image of the 'lip' of the glacier taken by the forward looking camera on the bot.